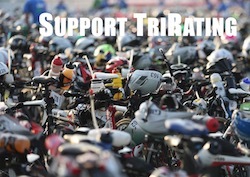 The analysis for IM Maastricht is supported by Ruud de Haan and his Dutch website Trikipedia.nl. Update Sept 22nd: Seven weeks after the race there is news that the race results have been changed (Instagram post by Angela Naeth). I have not seen anything official yet, but possibly race winner Els Visser and third place finisher Sonia Bracegirdle have been DQ’d for cutting the course in the swim. This would make Yvonne Van Vlerken the winner of the race and also subtly change the points allocation so that Angela has now received a late Kona slot. I will update as more facts become known. Dutch Triathlon website 3athlon.nl has some statements from NTB, the Dutch national governing body, confirming the DQs (Dutch language). This year’s IM Maastricht was quite slow, it started with a very slow swim (adjustment of -3:14), a relatively quick bike and a slow run. Almost every Pro athlete had at least one “bad” leg. Els Visser set a new bike course record, she was able to almost break five hours and improved on Brooke Brown’s 2017 time by almost 14 minutes. Katja Konschak (now 4.110) is in the bubble. But not counting Yvonne she is the athlete with the most points looking for an August slot, and she is quite likely to receive a slot. Haley Chura hasn’t been able to improve her total (still 3.875), just as Camilla Lindholm after her DNF (still 3.920). Both are still within the Top 7, but in the last races in Sweden and Mont Tremblant that are likely to overtake them. Els Visser (3.130) and Angela Naeth (3.425) have improved their total but are still short of getting into the Top 7.